A keynote highlight of this year's Sigfox Connect was the presentation of the work of the Sigfox Foundation and its rhino tracking system. Free-living rhinos in Africa have been equipped with GPS trackers and Sigfox's low-power sensors for over a year now. The project's findings should help to better protect these endangered animal species in the future. iSave the Rhino According to Save the Rhino, an international organization for the protection of endangered rhinos, there are less than 30,000 animals worldwide - compared to half a million 30 years ago. Rhinos could die out in less than ten years if poaching continues unchecked as before. A large proportion of rhinos in South Africa live in fenced and guarded reserves. In Kenya there are also various private and public protected areas. Due to the increasing number of rhinos killed by poachers in southern Africa (almost 800 rhinos in 2013), new countermeasures had to be introduced in 2013 alongside armed gamekeepers, dehorning of wild animals or resettlement of individual individuals or smaller populations. 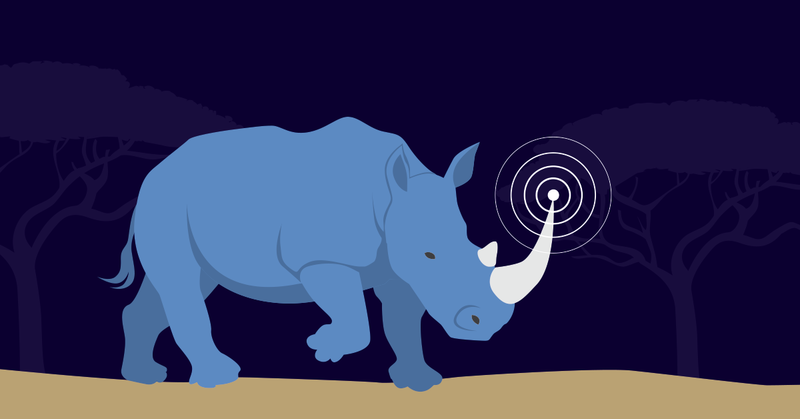 Sigfox Foundation is a non-profit entity using Sigfox network and connected objects to tackle causes, taking action on the protection of endangered wildlife, especially on rhinos, threatened of exctinction. The Sigfox Foundation is supporting conservationists with its IoT sensors in order to better monitor - and thus protect - the animals in the future. They provide accurate location data that is tracked via a secure tracking system on the Sigfox network. If the exact functionality of the Sigfox technology and LPWAN in particular is unclear to you, we recommend this article as an introduction. The work carried out jointly by Sigfox and the Lowveld Rhino Trust initially consisted of setting up the infrastructure of the Sigfox network - the animal rights activists only needed four days to do so. Initially, ten animals were equipped with Sigfox technology. After successful tests, a much larger number of wild rhinos were equipped with IoT sensor modules. The animal rights activists hope that the tracking system will help them better understand the endangered species and ultimately protect it better. Sigfox Foundation also using a GPS tracker prototype. Implanted in the horn of black and white rhinos, it transmits three location signals per day over the Sigfox network via a secure platform also developed by Sigfox. The battery life of those modules is between one and three years, so rhinos do not need to be captured frequently and fitted with new batteries. The next step is to develop a new generation of long-life wireless IoT sensors. And the ultimate goal is to produce nearly 30,000 networked sensors to track all living rhinos around the world. The rhino family is one of the most successful and diverse mammal groups in recent Earth history and can be traced back about 50 million years. During this time a broad evolutionary development and adaptation to the respective habitats took place. Representatives of rhinos occupied almost every terrestrial biotope. It is up to us whether our children will still have the chance to see rhinos in a few decades.